Product prices and availability are accurate as of 2019-04-07 04:45:32 EDT and are subject to change. Any price and availability information displayed on http://www.amazon.com/ at the time of purchase will apply to the purchase of this product. Exclusively from A Taste of Kentucky! If you bleed true Wildcat Blue we've got you covered with this bourbon barrel head with the University of Kentucky logo imprinted on top. Constructed from an actual used and repurposed bourbon barrel head, this white oak barrel head has been mounted to a support panel with keyhole slots for hanging. The barrel char has been retained for authenticity and this high resolution direct print image is ready to hang. While each barrel head is slightly different due to its handmade construction, the barrel heads generally run 21" across and 1.5" thick. 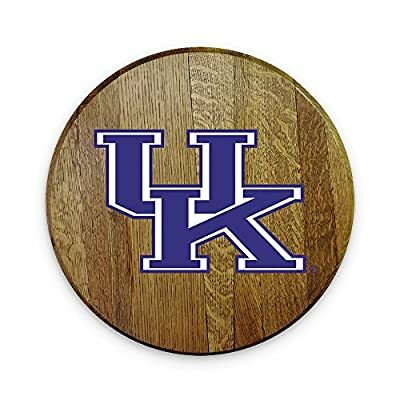 This officially licensed piece of sports memorabilia is certain to complement any sports fan's game room, office, or bar area.